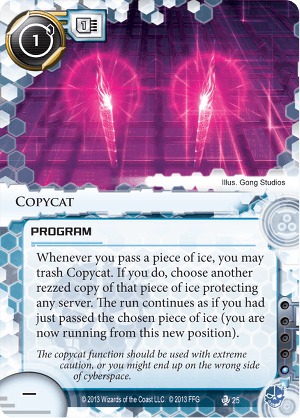 The copycat function should be used with extreme caution, or you might end up on the wrong side of cyberspace. It's cheap, both in influence and install cost. It doesn't start its own run - it modifies an existing run, meaning that it plays nicely with event-based runs and what not. It can be installed mid-run (via Self-modifying Code, Clone Chip or even Savoir-faire if you're feeling fancy), meaning you'll often have zero telegraphing - the corp won't know what's coming until you skip past their ice-tower of doom. It doesn't require you to actually BREAK the ice - just pass it. Meaning that it plays nicely with things like Femme Fatal, or trace-ice that you can just pay through. It has a very useful interaction with Replicating Perfection - you can run on a central, and then use copycat to warp somewhere else. Meaning that you can effectively run on a remote on your first click. It can potentially save you an absurd amount of money, if you can use it to skip multiple ice. It only works with rezzed ice, so how effective it is depends heavily on how much ice you can make the corp rez. So why isn't it used more? While it has the potential to be really strong, it can seem inconsistent, and difficult to use. No one wants a dead card just because the corp set up their ice wrong. So how do you actually use it well, and change it from "janky nonsense" into something that you can actually count on? I'd like to introduce you to my two friends: Escher, and Rielle "Kit" Peddler: Transhuman. Kit Pedler means that you have early aggression in spades, with her ability to run in near-complete safety, with nothing more than a decoder. And early aggression means that by the time late-game rolls around, you should have forced them to rez the bulk of their ice - at least 2 ice per server. Escher is where the fun really starts. It's already a great card for Kit - With so much ability to pressure the corp into rezzing ice, she's going to have a lot of information to make informed decisions, when deciding what to put where. And with her ability so dependent on ice position, just swapping the order of ice on a server can make it significantly cheaper for her to get in. But once you throw copycat into the mix, it gets downright silly. It means that once per game, you can have a power turn where, no matter how much ice they've put on a remote, you can get in, usually for the cost of getting into HQ, plus some change. When so much of netrunner depends on finding ways to throw off the other player's estimation of your capabilities, it's astonishing to me that this card doesn't see more play. It doesn't fit into every deck, but for the ones where it does, this is a card that wins games.